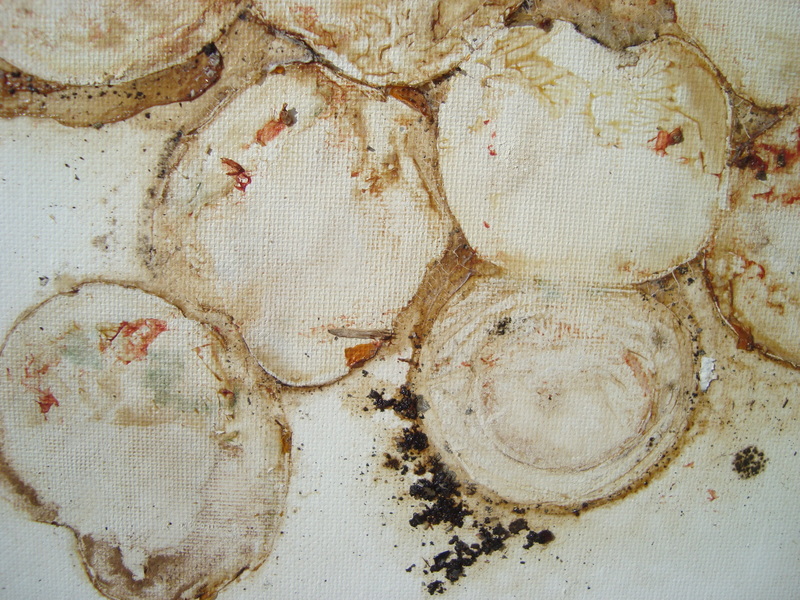 Something I have been doing for a while now is experimenting with rotting food onto different materials. This actually started last year during a color study of organic tomatoes versus non-organic tomatoes. 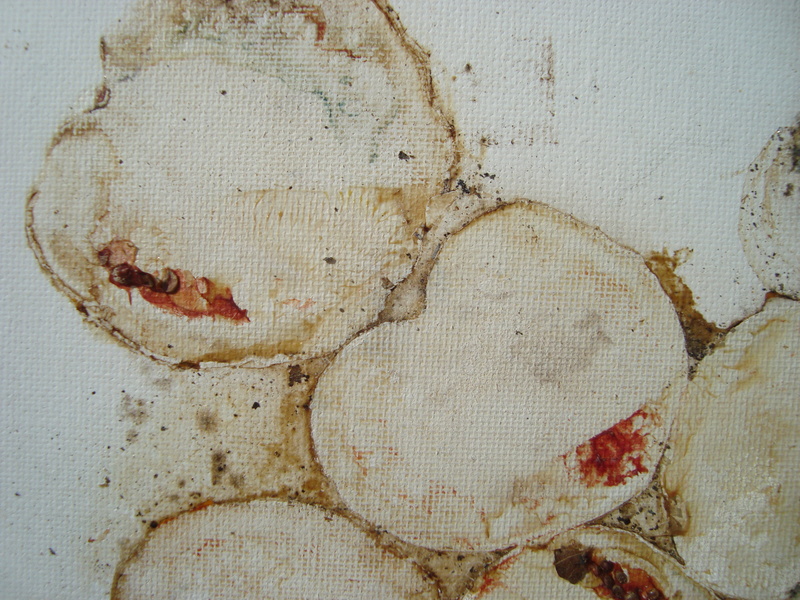 I had a still life of tomatoes set up in my studio that was sitting on a piece of paper. 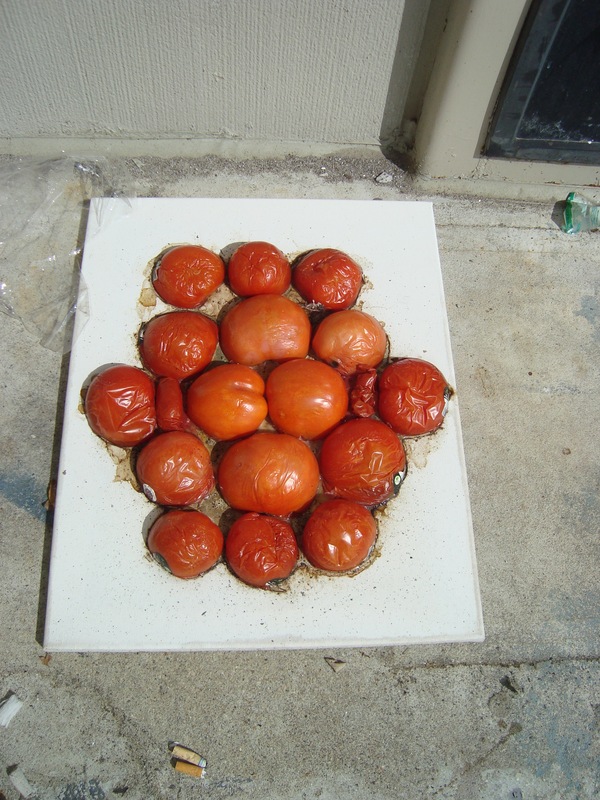 As I took forever to paint this still life, the tomatoes rotted over time. I peeled them off of the paper and noticed a beautiful little print. It was then that I had an epiphany. I was taking a class at the time of this discovery called “Paths to Nirvana”; I have always been drawn to Buddhism and decided to explore it further. A concept that I was particularly interested in was that of impermanence. I learned about Tibetan monks and how they make intricate sand mandalas as a form of group mediation. When they have completed a mandala, they will dump the sand into a nearby stream or body of water in order to represent impermanence and non attachment. This is the idea I’m after. I think it’s fascinating that everything is in a state of flux. Even the files on your computer can decay and change over time, especially if you neglect to open them. It’s crazy! 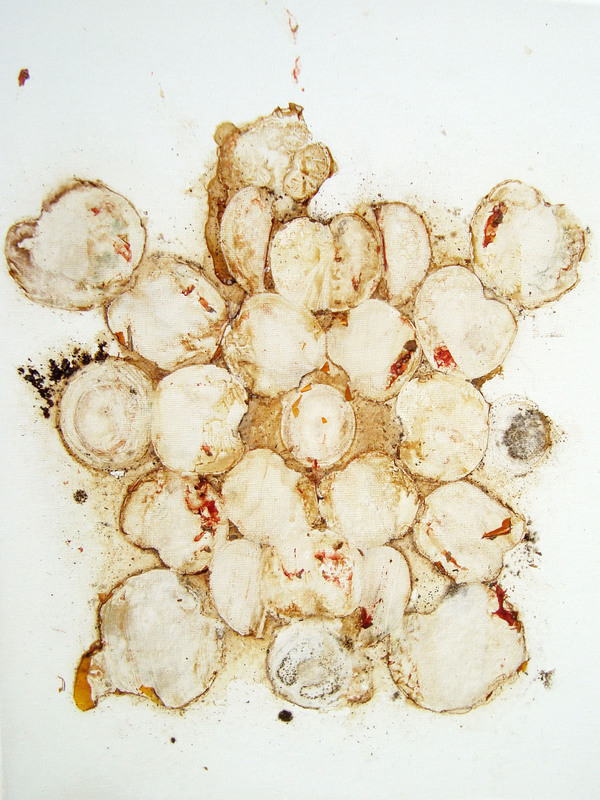 This summer, I started rotting different fruits and vegetables onto paper in the shape of mandalas. Unlike traditional Tibetan mandala-making, I am not meditating during this process because I am not directly involved with it other than at the very beginning and very end. 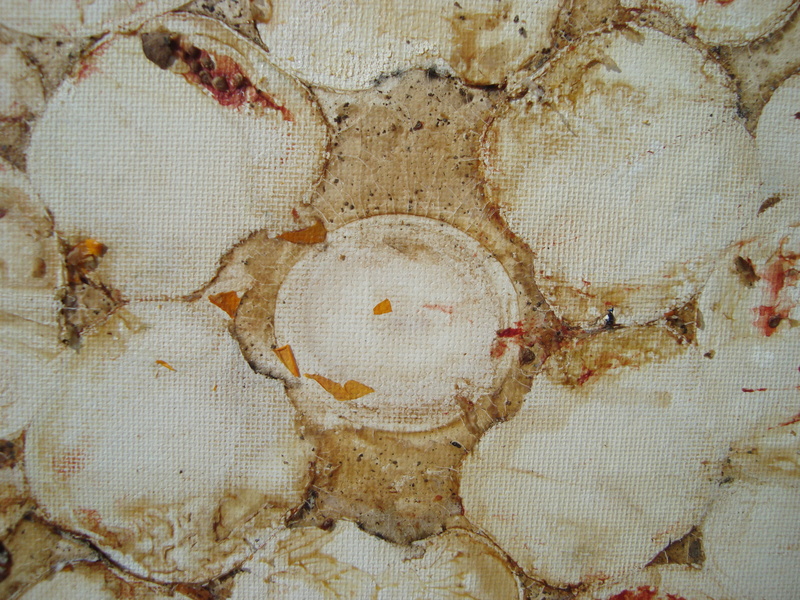 Rather, I am solely representing impermanence in materials; organic materials have impermanent pigments. Therefore, these prints will fade over time and eventually disappear. 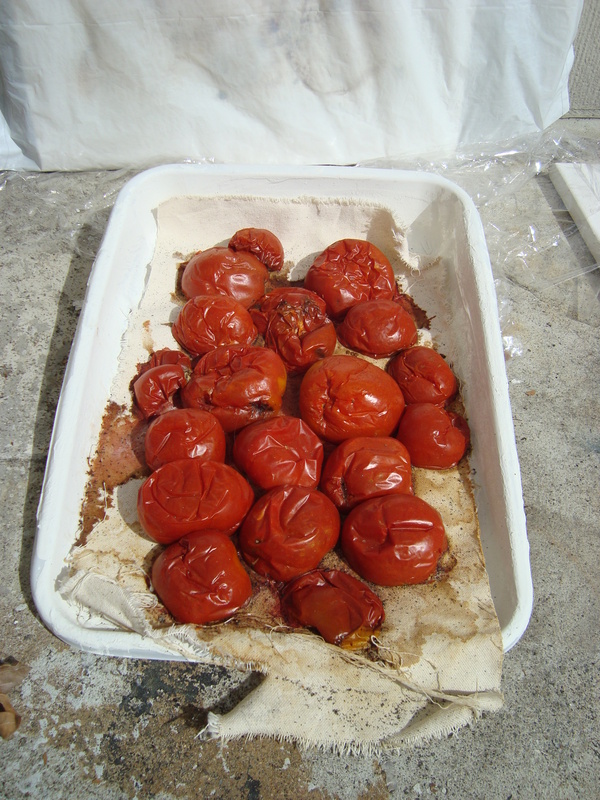 I am also letting some organic tomatoes rot onto un-gessoed canvas to see how differently the pigments are soaked up. I can’t wait to peel these off and see how crazy they look!